Just an hour’s flight from Tokyo, the islands of Okinawa, already popular with Japanese travelers, continue to emerge as a top destination for foreign visitors as well, especially from short-haul markets in Asia. In late June, for instance, EVA Airways launched a Taipei and Naha and is already enjoying 95 percent occupancy. Americans are less informed. To us it’s known mostly as one of the most brutal battles in our history, taking three months and taking more than 240,000 lives. Okinawa is the name of the main island in the group of 160 tropical islands known as the Okinawan islands. There’s plenty there for visitors including fine beaches, Japan’s best scuba diving, relaxed villages, golf courses and a history as a kingdom distinct from Japan. The island currently finds itself involved in several controversies ranging from the potential for casino gambling to a rocky relationship with the U.S. Military bases there. About 74 percent of the U.S. military personnel stationed in Japan are located in Okinawa. Until recently, the U.S. military presence had been gradually shrinking, but an increasingly hostile relationship between Japan and China over conflicting territorial claims will likely increase the U.S. military presence in the future. At the same time, Okinawa’s tourism stakeholders see a rich potential in China and other nearby markets, especially with the 2020 Tokyo Olympics around the corner and an increasingly lucrative Chinese market that happens to love casinos and shopping malls. The pressure to find a friendlier Chinese solution is growing and tourism is the face of that more diplomatic approach. The industry continues to add new hotels and to work on a new airport. Feelers have been sent out about the possibility of building the kind of integrated resorts that are just perfect hosts for casinos. The latest hotel to add to the gathering critical mass of vacation resorts is the 346-room Hilton Okinawa Chatan Resort, which opened on July 2, as the 11th Hilton Worldwide property in Japan. 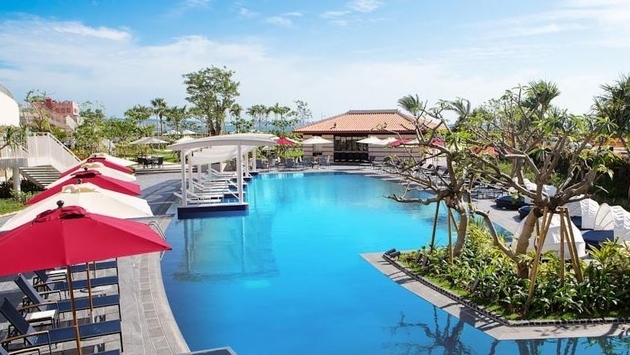 The resort has three swimming pools including a lagoon pool that incorporates a baby and children's pool with two waterslides, a pool featuring a waterfall and bar as well as a heated indoor pool. The resort is located near the Mihama Town Resort American Village, one of the Okinawa's largest entertainment, retail and dining precincts. The 238-room Orion Motobu Resort & Spa is also scheduled to open this month next to the Okinawa Churaumi Aquarium on Okinawa Island. Ritz-Carlton pioneered luxury travel to Okinawa when it opened its 97-room property there in 2012. The hotel targets Japan’s huge golf market with rooms overlooking the East China Sea and the Kise Country Club. Many of the subsequent generation of new hotels are located in Naha, the prefectural capital of Okinawa. The 226-room DoubleTree by Hilton Naha opened in May 2012. The Mercure Okinawa Naha opened the month before that. In 2013, the Tune Hotels flagship opened in Naha, Okinawa. One hotel that is getting much praise is the luxury hermitage-like Hyakuna Garan. Located about 35 minutes from Naha Airport, the hotel has just 15 ocean-view rooms. The resort is known for its serene atmosphere, which is created by making the natural elements overwhelmingly more prominent than the man made. An almost temple like is created as the hotel evokes Ryukan culture with its Gajumaru trees, limestone corridors and red tile roofs. Six outdoor baths with Japanese style like huts are free to guests. Okinawa is home to nine World Heritage-listed sites including Naha’s Shuri Castle from whence the rulers of the Ryukyu Kingdom oversaw their kingdom for almost 500 years. The Okinawa Prefectural Museum and Art Museum tells the history of Okinawa with an emphasis on the Ryukyu Kingdom and the World War II Battle. Kokusai-Dori Street is a mile long street that feels more like an American honky tonk strip than Japan. Popular with GIs the strip is crammed with restaurants and souvenir shops. When the Ryukan king banned weapons in 1879, karate was invented. The Murasakimura cultural village in Yomitan has English-speaking instructors; a one-hour lesson costs $26 including a stiff white outfit and the novice's white belt.